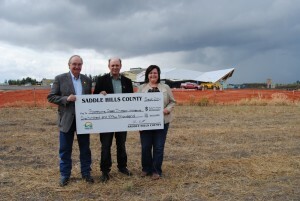 Saddle Hills County presented a cheque for $150,000 to the County of Grande Prairie No. 1 for the Philip J. Currie Dinosaur Museum on September 2, 2014, at the museum site. Saddle Hills is sponsoring the Palaeontology Research Centre (PRC) in the museum. The PRC will be the hub for year-round, ongoing research for the in-house palaeontologists and the base of operations for those visiting from other institutions around the world. Left to right, Ross Sutherland, Chair, River of Death and Discovery Dinosaur Museum Society, Reeve Alvin Hubert, Saddle Hills County and Reeve Leanne Beaupre, County of Grande Prairie No. 1. 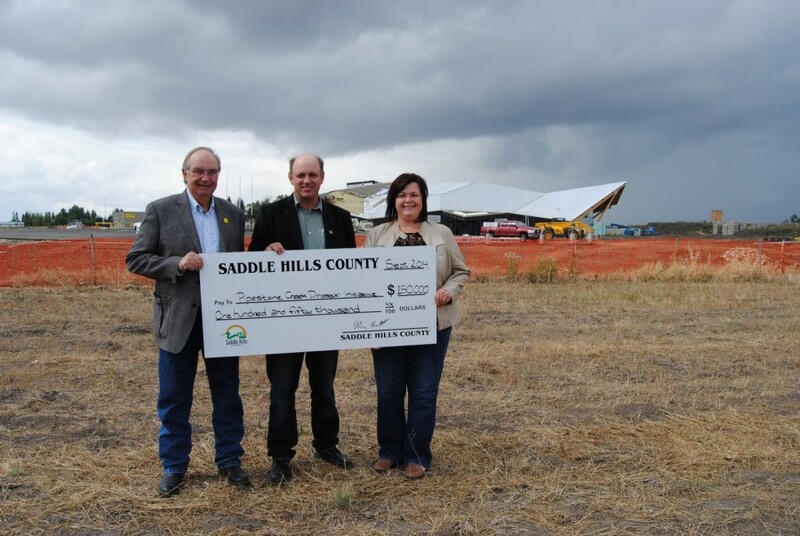 Comments Off on Thanks Saddle Hills County!